Healthy, Back to School Meals to Make Your Life Easier! I am so excited to share this post with my readers. I asked my good friend & Holistic Nutritionist, Stephanie Long, if she would guest post on my blog and share some easy ways to keep kids healthy in the chaos of back to school and busy morning routines and she said Yes! It’s that time of year again, back to school! For some of you, this might be your time to shine, prepping lunches, picking out stylish outfits for your kiddos, and jumping full force onto that PTA committee….and for others, it might be a time where you feel burnt out and ready to call it quits. We all do life a little differently, and today I want to let you in on some easy tips and tricks to help you to maintain a little more balance. Get ready for eager and not-so-eager moms to unite! A good habit to get your kids into would be to start drinking a full glass of room temperature water upon waking. A dose of H2O in the morning will help to cleanse their digestive system, leading to less belly aches, more regular bowel movements, and decreases the chances of your little ball of energy getting dehydrated throughout the day. Keep them drinking water all day long, and replace those artificially flavoured, sugary drinks with good old H20! It’s also really important that you start off your little ones day by getting some healthy, blood sugar stabilizing food into them. We want to fill them up with loads of nutritious vitamins and minerals and avoid all of those sugar laden cereals that will only lead to a disastrous crash within hours. A quick breakfast option for your little one is overnight oats. This new breaky will become your best friend because of how simple it is to make! 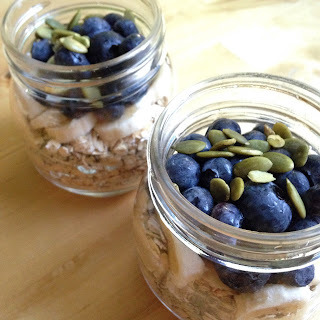 Simply fill half a mason jar with rolled oats (approx. ½ cup), top with fruit of choice like blueberries, strawberries, apples or bananas and top with some full of fibre seeds like hemp or ground flax. Fill the jar with milk of choice (coconut or almond are always great non-dairy alternatives, especially if your little one has a dairy sensitivity) and place in the fridge. In the morning you will be greeted with an oatmeal bowl that took next to no time to prepare. You are also avoiding any refined sugars by naturally sweetening the oats with fruit, maple syrup or honey, or a spice like cinnamon. You’re also doing an A+ job by stabilizing their blood sugar levels, which will avoid any teenager-like attitudes mid-morning, and also pump them full of beneficial B vitamins. B vitamins help to bring stress levels down and reduce any anxiety that your little one might be experiencing. Now that we’ve got breakfast out of the way, a great snack that you can give your growing little nugget is a small container of trail mix. Nuts and seeds are full of protein, and your little growing one needs all the protein they can get. Think of protein as the building blocks of their body, and ensuring that they are getting enough is helping their cells shine and get super healthy and strong. If your little peanut (no-pun intended!) has a nut allergy, try a snack of hummus and cut up veggies. Chickpeas are also full of protein, and hummus is so simple to make on your own. Simply toss 1 can (go for BPA free whenever possible) of chickpeas, 1 clove of garlic, juice of 1 lemon, ¼ cup tahini, ¼ cup water and 1 tablespoon of EVOO in a food processor or blender, and voila! Homemade, preservative-free hummus for your little one to enjoy. Starting the day off feeling well-fed and less stressed will definitely set the mood for the rest of the day. Remember that making small, consistent changes over time with your little ones will set them up for a lifetime of success! Stephanie Long is a Certified Holistic Nutritionist who specializes in digestive issues, food sensitivities, anti-inflammatory diets and skin care. She provides one-on-one consultations to clients through www.stephanielongnutrition.com. You can also check her out on Instagram @stephanielongnutrition or on Facebook – Stephanie Long Nutritionist. Does it matter whether I use quick rolled oats or the large flakes? My daughter loves oatmeal so this is perfect for her because I don't have time to cook oatmeal in the morning. Thanks for sharing.